Home/General, Patient Resources/Dr. Google can save lives, but also can get it wrong. Some poor information regarding Inflammatory Breast Cancer. Please see update June 18, 2016 regarding this note. Not to be a Debbie Downer, but I wanted to share something an IBC sister pointed out to me. She was searching for information on Inflammatory Breast Cancer. When she put the term in Google for a search, a blue box popped up on the right side, that basically gives a brief synopsis. The general information on IBC was somewhat standard but for one very important detail. The information card said that that it “RESOLVES WITHIN MONTHS.” Well, as you can imagine, this bit of the information is not only irresponsible, it is dangerous. This disease has a cavernous of lack of information so to add erroneous information any way, shape or form is dangerous to patient care. The REAL statistics from The American Cancer Society are: Inflammatory breast cancer (IBC) is considered an aggressive cancer because it grows quickly, is more likely to have spread at the time it is found, and is more likely to come back after treatment than most other types of breast cancer. The prognosis (outlook) is generally not as good as it is for most other types of breast cancer. And it goes goes on to list some stats. 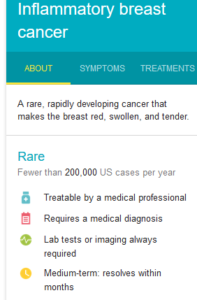 Please type “Inflammatory Breast Cancer” in the Google Search Engine and look to the right for the blue info box. Read it over. See the text next to the little yellow clock “Medium-term: resolves within months”. Then please go to the bottom of that square click on “feedback” and tell them the real 411 on IBC. Give them good information to share. You can share what the American Cancer Society has to say, http://goo.gl/HnDPVD as well as this great resource below. The IBC Network Foundation (and all volunteer ran charity) has a very informative & interactive app available to anyone wanting to know more about Inflammatory Breast Cancer. BTW Before you comment, “Why go to the internet at all?” Or “You can’t believe all you read on the net.” Etc, remember that this disease is viewed as rare. And there is a HUGE lack of information available, even to the point this is not taught in medical or nursing school. Women are having to fight for a diagnoses of a disease that they hope and pray they do not have. Let’s not make anything about this any harder that it as to be. btw, after misdiagnosis of many drs in a 4 month period, it was “Dr. Google” that I realized I might have IBC. That information was key to my proper diagnoses.